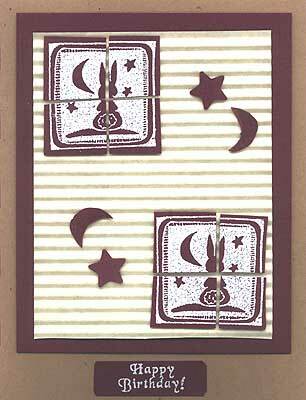 “Bold Block – Celestial Bunny” and “Happy Birthday!” are embossed in white on Burgundy card stock. “Solid Single Star” is stamped twice with a VersaMark pad on the burgundy card stock and cut out. The moon images are drawn by hand and cut out. The “Bold Block – Celestial Bunny” images are cut in fourths and mounted with foam tape with a space between each fourth to give the tile effect. The star and moon cut-outs are also mounted on foam. The corrugated card stock is layered on burgundy card stock and light brown card stock. “Happy Birthday!” is attached to the light brown card stock. Card by Margaret Wiggin.